Ernst Wahliss large ceramic wall plaque. Vintage Art Deco antique item, circa 1910s. Makers Marks underneath: Ernst Wahliss, Turn and Made in Austria. 41cm by 62cm and 7cm deep. 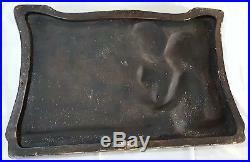 In excellent condition except for a very minor flake to the bottom left hand corner, see photographs. 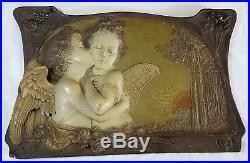 The item "Ernst Wahliss vintage Art Nouveau antique cherub large ceramic wall plaque" is in sale since Thursday, November 23, 2017. 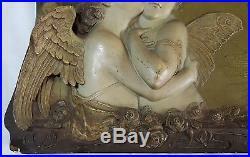 This item is in the category "Pottery, Porcelain & Glass\Date-Lined Ceramics\Art Nouveau/ 1890s-1919". The seller is "country_choice_trader" and is located in Louth.